Greetings from San Francisco: my wife Pat and I spent the last week / Thanksgiving with my son Marc who now lives in Berkeley. Urban warriors will love SF and should familiarize themselves with mass transit and the myriad of options that seem to congregate on Market Street. 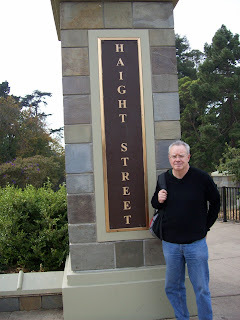 Old hippies like myself will enjoy the bohemian #71 bus that goes through Haight Ashbury on it’s way to Golden Gate Park. 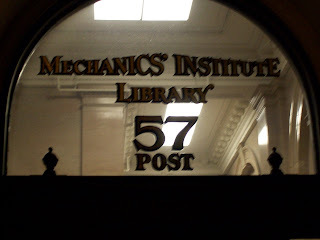 On Market, two Muni stops up from the Embarcadero is a quick walk into #57 Post Street to Mechanics Institute where their wonderful chess club resides, containing three large rooms plus a director’s office. On 11/25/20087 I arrived at 6pm to see their 12 round Tuesday night swiss begin round 10. Former BCF president Peter Sherwood hustled in approximately 6:20 and we spoke for a few minutes before the round began. Peter now lives in Oakland, is working as a programmer, and is happy here. He asked how the BCF was doing. 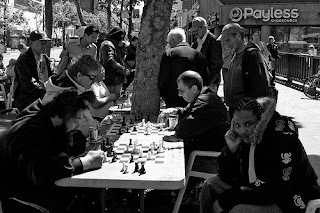 He mentioned that the Berkeley School of Chess sponsors a Friday night tournament. 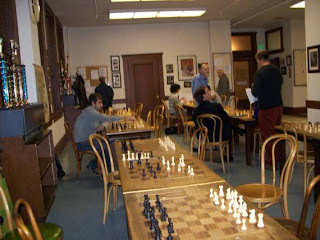 People at the club mentioned that Steve Brandywine (a former BCF member- one of the best blitz players around) holds open house at the Institute most weekday afternoons. For those who like outdoor chess, and what that entails, you want to go to “The Slab”: a mini park around the 900’s on Market street, near Powell. This has the flavor like Cambridge’s A Bon Pan, is not as climatically challenged, so play can go into the wee hours of the evening. Although we rented a car, I would have to say that the ambiance soaked in while using mass transit was more enjoyable. You can get 1 day, 3day, or a week’s Muni pass or pay $1.50 for most fares (with free transfer). Recommended rides to take: Cable Car Hyde/Powell Street (either way), the antique trolleys of the F line(too and from the Embarcadero/Fisherman’s Wharf to deep on Market), and the before mentioned #71 bus thru hippy heaven. In SF you can see the Spanish influence as many things are bilingual: example when arriving at the Embarcadero (place for debarkation) the antique Italian trolley flashes the message “ uscita fermata prenotata’. Many of the former T Green Line trolleys now roll along the F line (once called “Dallas Cars- as they were purchased by Boston from Dallas in the 20’s, and now having a third life). I would highly recommend you all visit this cosmopolitan city, steeped in chess, it’s like Boston with hills. What are some of your experiences and recommendations when visiting the San Francisco area. 1. Paul MacIntyre complimented me on the effort I put into the original article, but complained that I didn’t come to any definitive conclusion. My own human brain with the help of one chess engine (Fritz) surmised that while theoretically it is possible to hold this ending, practically it’s very difficult. If you want to see how I arrived at this conclusion, click here. 2. Jason Rihel asked me in the comments section what would happen if I let Fritz play against one of the other chess engines, and let them play it out 1000 times in quick games overnight. 3. I have chess software tools loaded on my laptop, but almost never use them. I wanted to see what these little used purchases could do, and let them do the heavy lifting. TO RECAP MY IMPRESSIONS FROM PART I: White wins if the c pawn reaches the 5th rank (no matter where Black places the a pawn), while keeping back the other pawn no farther than a3. Then White has less distance to defend the squares around the advanced c pawn and attack Black’s a pawn simultaneously, and can use the threat of knight forks to ram the extra pawn down to the last rank. If, however, Black can keep the c pawn on the 4th rank (which is MUCH easier said than done), then White will eventually be forced to advance his a pawn farther and farther up the board to avoid three-fold repetition claims. Then you’ll reach an ending where White’s a and c pawns are so close together that both can be attacked at once, leading one to be captured and obtaining a draw. For more on this evaluation, see below. First I will tabulate the evaluated game positions of three chess engines in ChessBase; then each engine will play itself; then the engines will play each other in a round robin; and then I will extrapolate the results. I used Fritz 10, Rybka 2.3.2a, Shredder 11, and ChessBase 9.0 for this exercise. And I mentioned this in part I, but it bears repeating here: the Nalimov tablebases cannot be applied to the Adamson-Cherniack position because they deal with endings with 6 pieces or fewer; this ending had 7. This table came from loading the chess engines in ChessBase 9 by using the 'Add Kibitzer' (Control K) function, and then replaying the ending. Although evaluations from chess engines can change by waiting 5-500 seconds, for practical purposes the longest I waited for a move’s evaluation was 20 seconds. Obviously Fritz, Rybka, and Shredder all gave White an advantage because of the extra pawn, but the three engines disagreed on the extent of White’s advantage. Fritz was the most gung-ho in giving White a winning advantage, Shredder gave Black the most optimistic drawing chances, and Rybka was somewhere in between. Also, Rybka and Fritz both believed that the position after White’s 81st and 82nd moves is dead equal. I went back and left the engines on those moves for an hour with the same result. For the life of me I cannot see any threefold repetition there. If anyone knows why the algorithms in these engines would declare the ending drawn at those moves, please let me know! I ran Shoot Out Mode in several different ways, experimenting with the quantity of games, type of game, move limit, and ply depth fields. The part of me who wanted to recreate exactly the playing conditions of the original tournament game clashed with the part of me who wanted to extract the maximum possible data from the shootout matches. Various fast speed controls (5 minute, 10 minute, and 30 minute) were erratic, because at some point each of the engines tried the inexplicable continuation 53…Ke5 54.Kc3 Nd5+ 55.Kd3? (not forced: 55.Kc4 Nb6+ 56.Kd3) which gave Black a certain draw after 55…Nb4+ and 56…Nxa2. In the end I decided to heck with it, and chose one game for each engine with 60 minutes for each side, the same conditions that Adamson and I had during the ending. Considering the initial evaluations of the ending (Fritz .88, Rybka .62, and Shredder .70), I wasn’t that surprised at the results. My firsthand experience with computers’ deadly defensive accuracy was confirmed - all the position evaluations in the games never tipped above 1.00. 5. Click the Openings DB button in this window to select the database with the Adamson-Cherniack ending, in order to determine the starting position of the match. I spent 2-3 weeks casting about in trying to find the ideal time setting for Engine vs. Engine matches. After establishing that the games in a 4 game match between two competing engines was not an exact duplicate of a two game match, the biggest challenge was finding the ideal balance between quantity (cf. Jason Rihel: “Hey Alex, What happens if you let Fritz play against one of the other chess engines, and let them play it out 1000 times in quick games overnight?”) vs. quality (does an engine with sixty five minutes play better chess than with sixty minutes?). b). At the same time control settings, the same narrow range of themes was repeated 50 times over. I settled upon staggering different time controls between all the chess engines: 10 games at one hour, 4 games at one hour thirty minutes, and 2 games at two hours. By the way, Black’s 56th move in this game makes no sense – why not 56…Kc5 preventing 57.Kc4? I was not going to experiment with games of this duration - let’s face it, this isn’t a reenactment of Remembrances of Things Past. For those of you with multiprocessor versions of these chess engines, knock yourselves out. The most obvious result was that all the games were drawn, so (unless a supercomputer proves otherwise) Black always has a draw with best play. Rybka as Black kept a stranglehold on the c4 square. The c pawn was blockaded on the third rank. The best Fritz could do was play its King to b5. Rybka played a6+, Fritz took the a pawn, and Rybka won the c pawn with a draw. Rybka as White exchanged Knights with Fritz, but left its King on a4 and the c pawn on the second rank. Fritz, having captured Rybka’s Knight on d4, played Kc3 and obtained a drawn pawn ending. Rybka maintained a blockade on the c4 square. Fritz won the a pawn and was actually two pawns up. However White’s Knight was tied down to the defence of the c pawn, and could not advance the a pawn. Fritz had to give up one of the pawns with a draw. Rybka as White could not advance its King beyond the third rank. Eventually Rybka’s King was able to reach e4, but Fritz with its King on a4 was able to wipe out all of Rybka’s pawns. Rybka was able to push the c pawn to the fifth rank, but at the concession of playing the a pawn to the fourth. Fritz’s Knight picked off the a pawn with a draw. Fritz as White did not move any pawns and kept the King on b2. Shredder placed the Knight on e5 to control the c4 square, played the King to d3, advanced the a pawn past the fourth rank to divert Fritz’s King, and won the c pawn with a draw. Shredder won Fritz’s a pawn, but was boxed in as follows: WKa6, a4, c4, BKc6, BNd3. Shredder had to give up one of the pawns so that the King could escape, and give Fritz a draw. Shredder as Black kept a stranglehold on the c4 square. The c pawn was blockaded on the third rank. The best Fritz could do was play its King to b5. Rybka played a6+, Fritz took the a pawn, and Shredder won the c pawn with a draw. Fritz allowed Shredder to advance the c pawn to the sixth rank, but was able to counterattack the a pawn with the King. Shredder gave up the Knight defending the a pawn and advanced the King to d7, but Fritz’s Knight held the draw. Shredder maintained a blockade on the c4 square. Fritz won the a pawn and was actually two pawns up. However White’s Knight was tied down to the defence of the c pawn, and could not advance the a pawn. Fritz had to give up one of the pawns with a draw. Shredder as White was able to advance the c pawn to the fifth rank, but could make no progress in the following position: WKb4, WNd3, c5, a3, BKc6, BNd2, a6. Shredder had to jettison the c pawn with a draw. Rybka as White exchanged Knights with Shredder, but left its King on a4 and the c pawn on the second rank. Shredder, having captured Rybka’s Knight on d4, played Kc3 and obtained a drawn pawn ending. Rybka as Black kept a stranglehold on the c4 square. The c pawn was blockaded on the third rank. The best Shredder could do was play its King to b5. Rybka played a6+. Unlike Fritz, Shredder did not take the a pawn. However Shredder eventually played its a pawn up to the fourth rank, where Fritz blocked it with a5, and later picked it off with a draw. Shredder maintained a blockade on c4. Rybka went after Shredder’s pawn on a5, giving up the c pawn with a draw. Rybka as Black maintained a blockade on c4. Shredder’s King went after Rybka’s pawn on a7, giving up both of its remaining pawns with a draw. Shredder as Black maintained a blockade on c4. Rybka went after Shredder’s pawn on a5, giving up the c pawn with a draw. Rybka exchanged Knights with Fritz, but left its King on d7 and the c pawn on the second rank. Fritz, having captured Rybka’s Knight on d4, played Kc3 and obtained a drawn pawn ending. From these games I can give Paul MacIntyre a more definitive assessment of the ending. The new knowledge from analyzing the computer match games is in red. White wins if the c pawn reaches the 5th rank (no matter where Black places the a pawn), while keeping back the other pawn no farther than a3. Then White has less distance to defend the squares around the advanced c pawn and attack Black’s a pawn simultaneously, and can use the threat of knight forks to ram the extra pawn down to the last rank. If, however, Black can keep the c pawn on the 4th rank (which is MUCH easier said than done), then White will eventually be forced to advance his a pawn farther and farther up the board to avoid three-fold repetition claims. Then you’ll reach an ending where White’s a and c pawns are so close together that both can be attacked at once, leading one to be captured and obtaining a draw. There, I've scratched the itch. I won’t be analyzing this ending any more. Famous Last Words - Need Your Help.